Eben Bayer grew up on a farm in Vermont learning the intricacies of mushroom harvesting with his father. Now the Rensselaer Polytechnic Institute graduate is using that experience to create an organic insulation made from mushrooms. 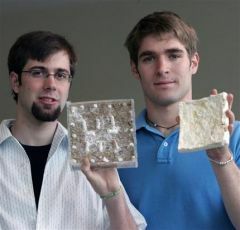 Combining his agricultural knowledge with colleague Gavin McIntyre’s interest in sustainable technology, the two created their patented “Greensulate” formula, an organic, fire-retardant board made of water, flour, oyster mushroom spores and perlite, a mineral blend found in potting soil. The two say recent tests at the National Institute of Standards and Technology have shown it to be competitive with most insulation brands on the market. A 1-inch-thick sample of the perlite-mushroom composite had a 2.9 R-value, the measure of a substance’s ability to resist heat flow. Commercially produced fiberglass insulation typically has an R-value between 2.7 and 3.7 per inch of thickness, according to the Oak Ridge National Laboratory in Tennessee. Here’s how it works: A mixture of water, mineral particles, starch and hydrogen peroxide are poured into 7-by-7-inch molds and then injected with living mushroom cells. The hydrogen peroxide is used to prevent the growth of other specimens within the material. Placed in a dark environment, the cells start to grow, digesting the starch as food and sprouting thousands of root-like cellular strands. A week to two weeks later, a 1-inch-thick panel of insulation is fully grown. It’s then dried to prevent fungal growth, making it unlikely to trigger mold and fungus allergies, according to Bayer. The finished product resembles a giant cracker in texture.